Sorelle is finished, but the last couple of days have been gray and rainy, and I'm waiting for better weather to take some photos. And I've decided to give myself a break--a short one--on writing up the pattern, and instead have been playing with some...COLOR! Sorelle e finita, ma il scorso paio di giorni erano grigio e piovoso, e sto aspettando a migliore tempo per scattare delle fotografie. E ho deciso a darmi una tregua--una breve--per scrivere il modello, e invece stavo giocando con del...COLORE! Much ado about nothing small but important details. By now I've knitted a number of swatches--or rather, begun and then stopped a number of scarves--and I'm warming up to the yarn the husband chose ("Elen" from Filatura di Crosa, a wool/viscose/cashmere/silk blend). It has a nice feel and weight, holds up well to frogging!, and if you look very closely, there is a lovely bright blue thread accenting the darker navy. Here is my first false start: I took the original "seaweed" pattern from BW's 2nd Treasury, changed the position of the repeat so the wavy vertical knit ribs are centered (I also had to add an extra stitch so there would be the same number of stitches outside the last rib on both ends of each row), and added a border of seed stitches on the sides and ends. This samples illustrates the pluses and minuses of charting, by the way: after I transferred BW's pattern to a chart, it was easy to see how to change it (the original pattern had the rib falling at one end of the repeat), and easy to place the seed stitch border symmetrically--but hard to tell that the seed stitch border detracts from rather than enhances the pattern stitch. This is somewhat a matter of taste, but to my eye the best part of "seaweed" is the long wavy lines, and the bumpy texture of the seed stitch border fights those lines. For my next attempt, I added a short rib border, but that was too messy and required refrigeration--not so terrible if the scarf will only be worn by a snowman, but... (short ribs, get it? haha). Anyway, the pattern repeat is 6 stitches, so a 3 X 3 rib worked well, and I decided, after considering a rib or garter stitch border along the sides, to forgo a side border. The top photo is the "wrong" side of the scarf, which is actually quite attractive, and the bottom photo is the "right" side. Now, I like the slightly wavy effect along the sides, but I wasn't sure if the husband would, and I wasn't sure the short ribs were a worthwhile addition. So I tried a few super-simple side borders, meaning one to four stitches in various combinations of knit-purl, chose what seemed to work the best, and then started yet again (hold the short ribs). Here is the result of that last experiment: a side border of p2 k2, and no ribs along the bottom. The verdict? I like the version with no side borders better, but without the short ribs--which means that I'm going with the most simple version of this scarf possible. Was all that other stuff wasted effort? 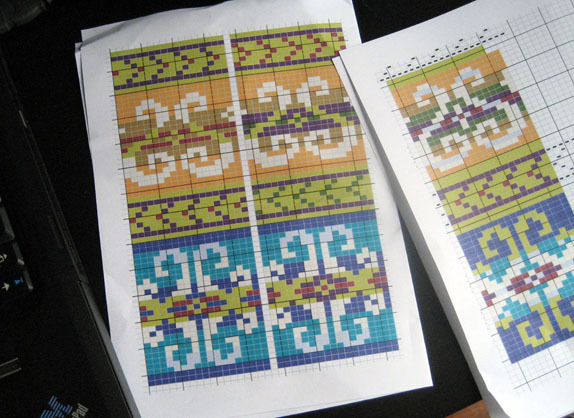 Well, for someone who is fairly new to the process of creating original designs, and who is having a wonderful time playing with her new Stitch & Motif Maker software (http://www.software4knitting.com/pstitchmotif/stmkr.htm) -- definitely not. And now, I'm trying to remove the short rib border on the version I pictured above (thinking that if I unravel from the cast-on edge to where I'd like the scarf to start, then bind off, I can happily Knit On, rather than beginning over yet again), but I'm hitting an unforeseen snag--more on that, with photos, and a chart of the final scarf pattern, in my next post.